I thought that these tickets may be of interest. Transport Company Limited. In 1952, following nationalization of the bus industry, the Highland Transport Company Ltd became Highland Omnibuses Limited, a name familiar to many. The lower photograph is an example of a Ross & Cromarty Education Dept. funded scholars' railway season ticket for pupils attending Invergordon Academy. 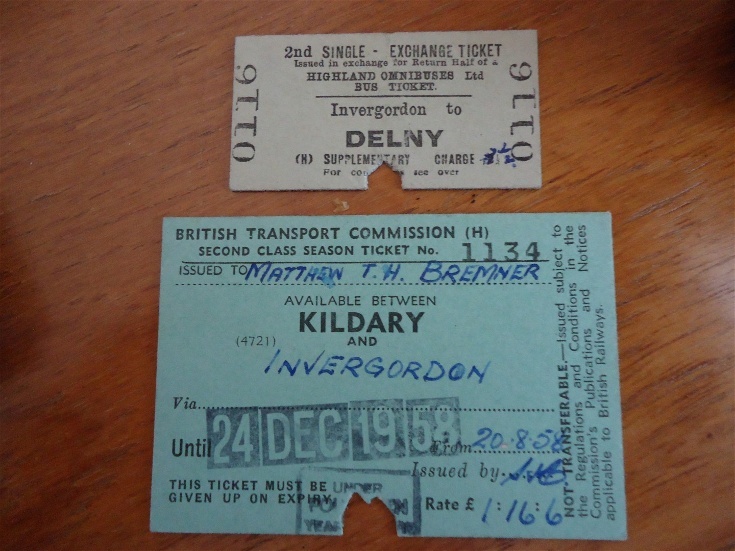 This one was issued at Kildary Railway Station and was valid for return railway travel between Kildary and Invergordon from the start of the new term on 20 August 1958 (usually just before the Invergordon Games) and the Christmas holidays on 24 December 1958. It looks as if the initials of the issuing railwayman at Kildary could be "H.C."? The cancellation snip has partially removed an ink stamp which looks as if the pupil was "under fourteen years of age" at the time.